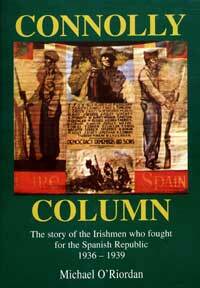 The first edition of this book appeared in 1979, when no Irish publisher was prepared to handle the title. This, the long awaited, new and updated version, remains utterly true to the original by republishing the main body of the text in exactly its original form. However, there is also the addition of 14 new appendices, comprising articles, obituaries and book reviews which all bring much fresh information to the reader who may already possess the original edition, notably, impressive obituaries for Maurice Levitas and Eugene Downing,and a fuller and more up to date roll of honour. The publishers, Warren and Pell, must be congratulated for republishing so many of the classic accounts of the Spanish Civil War, which had hitherto gone out of print; this is the latest in a series of most welcome reprints. Michael O'Riordan was born in the West Cork Gaeltacht of Ballinderry, Gouganbarra. He grew up in Cork City, where he joined the Fianna and the IRA. O'Riordan was a member of Republican Congress and the Gaelic League and friendly with Peadar O'Donnell and Frank Ryan. In 1936 Mick O'Riordan went to fight fascism in Spain with the XVth International Brigade. He saw action on all Fronts and was wounded at Ebro. In 1938, O'Riordan was offered an Army Commission by the Irish Free State, but chose instead to train IRA units in Cork. He was interned in the Curragh Internment Camp from 1939 until 1943, where he was OC of the Cork Hut. In the post-war era, O'Riordan worked as a bus driver in Cork and was active in the IT&GWU. In 1947, he stood as a Socialist Party candidate and afterwards moved to Dublin, where, in the 1960s, he was a pivotal figure in the Dublin Housing Action Committee. O'Riordan attended the 1966 International Brigades' Reunion in Berlin and was instrumental in organising the removal of Frank Ryan's remains from Germany to Ireland in 1979, the same year that the first edition of his authoritative account of the role of the Irish in the International Brigade was first published. He also campaigned on behalf of the Birmingham Six and attended their Appeal trial in 1990. Michael O'Riordan was for many years, the Chairperson of the Communist Party of Ireland, and published many articles under the auspices of the CPI. Connolly Column primarily focuses upon the Irish republicans and anti-fascists who fought in Spain, mostly within the British and Lincoln Battalions of the XVth International Brigade after January 1937. Leading figures such as Frank Ryan were IRA veterans of the War of Independence and Civil War. Ryan, like some other prominent Irish republicans, gravitated towards the left-wing Republican Congress in 1934 and the International Brigades in 1936. As well as the original vivid and well written eyewitness accounts of the war by O'Riordan, of particular interest is the contribution of his son, Manus O'Riordan, who convincingly contests such points as the critical re-evaluation of Frank Ryan's career by Ferghal McGarry and Robert Stradling of the relationship between Frank Ryan and Seán Russell during World War Two. These issues still resonate in modern Ireland, as evidenced by the vandalism of Russell's monument in Dublin in December 2004. Manus O'Riordan's chapter on Frank Ryan's latter years confronts the insinuation that he was in any way sympathetic to fascism, and concludes that Ryan was primarily an Irish patriot, in that he "undoubtedly fails to pass the Stalinist test of unconditional loyalty to the interests of the Soviet Union, as he also fails to pass the Churchillian test of loyalty to the British Empire." In the summer of 2003, Mick O'Riordan and Bob Doyle, the last surviving Irish International Brigaders, despite their advanced years, attended a commemoration of the 65th anniversary of the Battle of the Ebro, a decisive turning point in the Spanish Civil War. This moving international gathering attracted a large crowd under blue skies, and in the gruelling heat of a Catalan summer, with immense dignity and stoical patience, these veterans of the International Brigade sat alongside their comrades from many other nations, as speeches from local politicians half their age extolled the courage of their contribution to the fight against fascism. Returning to Barcelona, word went around the train that a Brigadista was on board; people young and old came down to shake hands and embrace Bob Doyle in gratitude for his and his comrade's help in their struggle against fascism 65 years earlier. Bob was easy to find, with his straw panama covered with anti-fascist badges and his rather surreal looking sunglasses with the words "NO TO WAR" emblazoned across the shades in protest against the invasion of Iraq. One woman tearfully explained that her grandfather had been amongst the countless thousands of republicans executed by the Franco regime after the fall of the Spanish Republic in 1939. She thanked Bob and his comrades on behalf of all her family; people who had silently and bitterly nurtured their anti-fascist and republican principles throughout the long dark years of Franco's rule. These spontaneous scenes demonstrated better than any speeches the genuine and sincere appreciation that lives on amongst the diverse peoples of Spain for the role of the International Brigade; this powerful book helps explain why this sentiment remains so heartfelt.